At UrbanLife, we want to connect your passion, skills or education with on the ground work, and we’re excited to partner with you in the development of your own leadership as you help develop others. 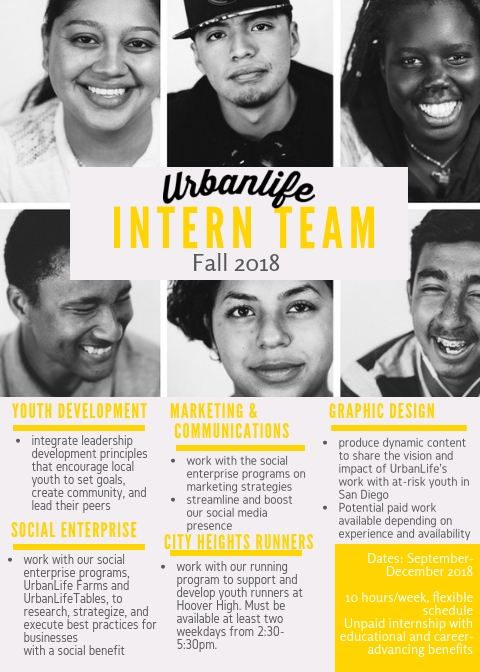 As an intern, you’ll spend 10 hours weekly learning the ins and outs of how a faith-based community development organization like UrbanLife operates. Get in the mix of our for-purpose social enterprises like UrbanLife Farms and Tables, learn how to manage a non-profit from the finances to the fundraising, or help craft our overall message through social media, videography and the written word. We guarantee you’ll gain hands-on experience with visible impact, while working closely with our amazing team of neighborhood leaders and staff. What are you waiting for? Apply now! Compensation: unpaid internship with the ability to coordinate with your institution to offer academic credit for your experience. Intern roles: we have openings for a social enterprise intern, a marketing & communications intern, a youth development intern, and a graphic design intern. You may check multiple positions on your application. teachable, creative, flexible and has a lot of initiative to work in environments where the work is never done! low-key tech skills like excel, g-suite, blogging, etc. Email Sarah at sarahcarter@urbanlifesd.org with any other questions.